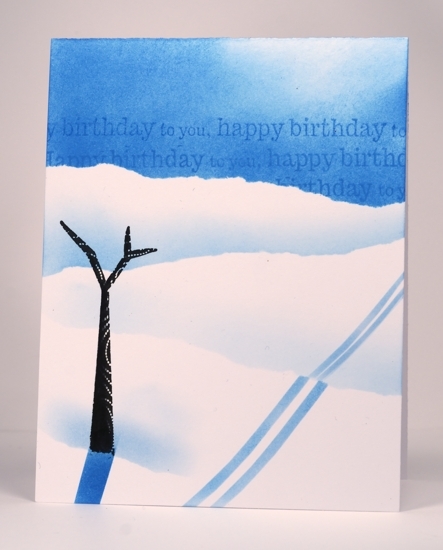 When I had this stamp out to make the birthday card I played around with a few different inks, papers and techniques. 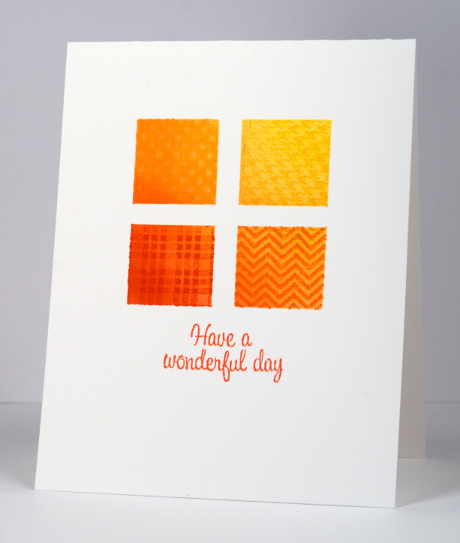 I know it is the size of a background stamp but I have stopped thinking of it as a background stamp as I am yet to use it in the background. It is such a pretty design it always gets to be the main event. When a stamp has a lot of blank un-patterned rubber on it, it can be hard to ink evenly so I played around a bit with inks and water to try and get past this issue. If you use a pigment ink it is juicier and will give you good coverage. I wanted to blend some colours on the stamp so I chose to use water soluble Memento dye inks instead. I inked the stamp generously with Paris Dusk and Teal Zeal then spritzed it with water giving the water and ink a little time to blend before stamping the image on white card stock. The blank rubber part of the image is not solid colour but I quite like the texture created with some tiny air bubbles and ink pooling. 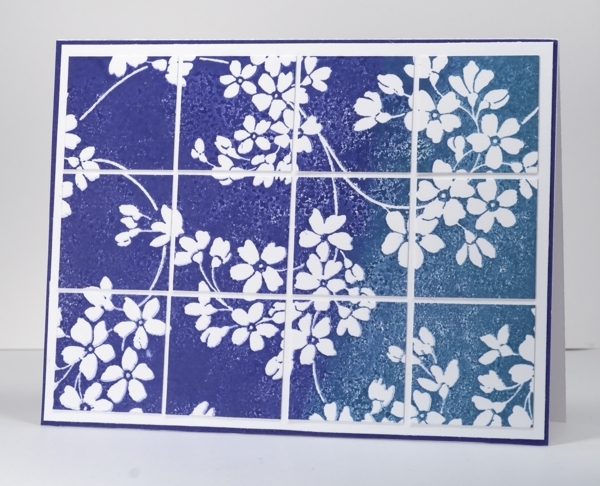 I tried the large image on the card base but decided to cut it into tiles to add another element to the design. Thanks for all your kind birthday wishes. My birthday is Sunday; my husband is exactly one week older and wiser than me! Several of you wanted to see the misunderstood birthday card I made for my husband so I have included it below. If you are as baffled as half my family were then you can mouse over the picture or click on it and you will see the photo title. the sparse landscape. We don’t like skiing out in the open like that; it gets too cold but as I was stamping at the last minute one tree was all this card got. Sad that the cardmaker’s family’s cards get left to last!